Getting into a public feud with the Trump White House is the best thing that could happen to CNN. The drama started when two of America’s biggest showboats collided. Like all nautical disasters, the wreck happened slowly, then all at once. Knowing it was coming didn’t make it any less mesmerising. You’ve probably seen the footage: An unwelcome question to the United States president from CNN’s Jim Acosta, a tussle over a microphone, and then a testy denunciation from the bully pulpit. Later, a pulled press credential for Acosta, a series of recriminations, a Saturday Night Live sketch, and then everyone called their lawyers. On November 16, a US District Court judge temporarily restored Acosta’s access to White House grounds. The ruling, however, was just the first stage of a long legal fight, and only a fool would underestimate US President Donald Trump in a drawn-out, vindictive lawsuit. Both sides are eager to paint the battle as a contest of good versus evil, where the very fate of truth and the future of the republic hang in the balance. In fact, what we are witnessing is a sick symbiosis, in which Trump is a golden goose and the Washington press corps is operating a 24-karat omelette station. This co-dependent love-hate relationship was not invented when Trump rode an escalator down towards his destiny in 2015. While dealings between the press and the president were unusually smooth during the administration of former president Barack Obama — for reasons of both ideology and temperament — even the previous occupant of the White House was hardly a model of transparency. He clamped down on photography, for instance, issuing carefully curated images instead of allowing the previous free-for-all. And as far back as 1936, Franklin Roosevelt had complained that “85 per cent” of newspapers were against him and called the press “poisonous propaganda”. Trump is a punter so far compared with Roosevelt in his war on the press. What is markedly different now is the medium through which the public experiences these snipe-fests. We are all watching them. In real time, and then over and over again on repeat. And with a president as polarising as this one, who never finds a shortage of sparring partners in the media, the temptation to binge watch is irresistible. For a sense of how much this can change what we’re seeing, it’s useful to look back at how cameras changed another piece of Washington business: Congress. The House opened to full-time video cameras on March 19, 1979, and the Senate followed in 1986. Congressional showmanship increased so significantly from that point on that it actually managed to break previously functional institutions. Tasks that had once been accomplished by putting brief remarks on the record became an opportunity to hold the floor in an otherwise empty room, ranting for the cameras — and generating footage for campaign ads. High-profile confirmation hearings, conceived as an attempt to elicit relevant information about nominees, were never entirely without controversy, but now include an entire opening day of blustery speeches by senators, who see the airtime as their due. Other than the outcomes of actual votes, vanishingly little news occurs where cameras are present. The real work of lawmaking is done elsewhere. Instead, for some, the briefing room has come to serve as a weird hybrid contraption for self-promotion — part soapbox, part springboard. Reporters can burnish their credentials before heading off to gigs as talking heads. 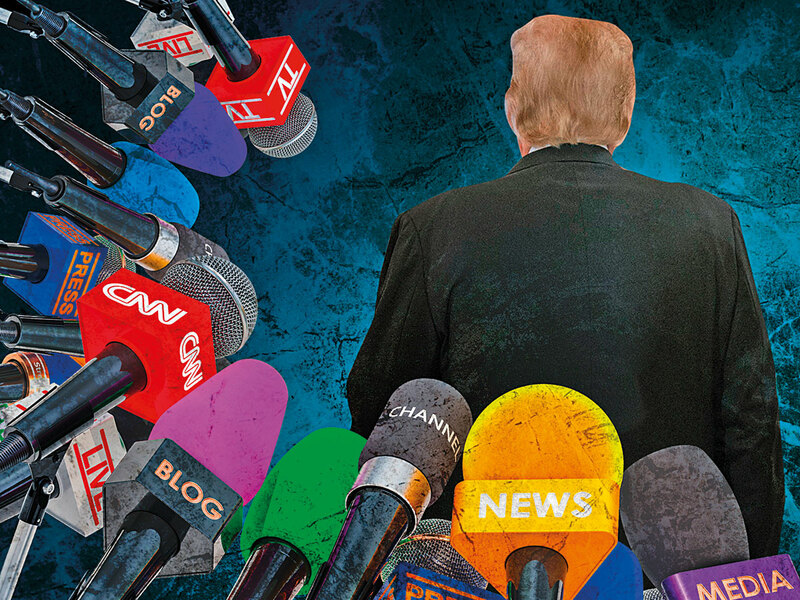 Even after two years of this administration, it is alarming to hear a president refer to the press as “the enemy of the people” and to consistently attack and undermine the media as it tries to hold him to account. It’s especially jarring when he singles out individual reporters for criticism. In an interview after the briefing room confrontation, Trump strongly suggested that Acosta’s aggressive style was motivated by personal financial gain. “He gets paid to do that,” the president said. Trump said of “nasty” reporter April Ryan, “she gets publicity and then she gets a pay raise or she gets a contract with CNN”. This is ungenerous, to say the least. But, as usual, there is more than a nugget of truth smothered under Trump’s helping of ad hominem sauce: The ferocity of today’s politics does seem to have been good for the bottom lines of the news industry as a whole. A report by the advertising research firm Borrell Associates estimates that television spending on political advertising in the midterms was $4.5 billion (Dh16.55 billion), perhaps triple what it was in the last off-year election. That infusion of unexpected cash has caused stock prices of media conglomerates to rise. When the story of Acosta’s martyrdom is told by the popular press and eventually Hollywood, it will certainly have a hero, and it won’t be the president. If there’s one thing Americans can agree on, it’s that George Clooney is the best person to play Acosta in the eventual feature film — assuming that Clooney continues to not age. The role of Trump will be played, of course, by Donald Trump. Or perhaps Alec Baldwin, assuming Baldwin does continue to age. But this isn’t an epic drama. It’s a reality show. And like reality shows, it doesn’t have a hero. The advent of C-SPAN coincided with a huge decline of public trust in the legislature. Gallup finds that 46 per cent of people say they have “very little” confidence in Congress, double the 23 per cent reported in 1979. Newspapers followed a similar trajectory over the same period (38 per cent today compared with 12 per cent). Gallup started asking about television news only in the early 1990s, but the decline is evident there as well. Was there ever a time when Americans believed their elected officials to be benevolent and omnipotent and their journalists to be objective and omniscient beings? Those 1979 confidence figures aren’t exactly overwhelming. But the benevolent and objective myth benefits the powerful, not the people. Puncturing it is not a loss for civility; it’s a gain for reality. Lies need to be countered with truths, certainly, and that’s something Americans have looked to the press to do in the past. But the same forces that buoyed Trump’s campaign have distorted news coverage towards sensationalism and away from sobriety. The best-case scenario, of course, would be for both elected officials and the Fourth Estate elites to be as pure as driven snow, in both action and intention. But that’s unlikely to happen, as all of those positions are occupied by human beings. There are genuinely serious questions at stake right now about civil rights, debt, redistribution and the future of state power. But neither the press nor the politically powerful stand to gain much by grappling with those problems on TV, and they are tacitly willing to remain locked in a vicious cycle as long as it means they don’t have to deal with the really sticky stuff. Which leaves us in a second-best scenario: If powerful politicians and powerful journalists can all, on occasion, be venal, petty and vain, it’s far better that the American people should have every opportunity to see that for themselves. That way, they will know to take every bite they are spoon-fed with a grain of salt. Katherine Mangu-Ward is the editor-in-chief of Reason magazine.